Mulch Delivered, by Burke Landscape Supply, sells and delivers Mulch, Stone, Sand, Topsoil Quality Landscape Supplies. Contact us for your landscape supplies. Our customers love our mulch. Our mulch selection includes triple or double shredded, dyed or natural, and hardwood or bark mulch. Send us your message or request. Just fill out your info or question below. We will respond quickly. Mulch, Sand, Stone, Soils Delivered to a 20 mile radius from our Trainer, PA 19061 landscape supply yard. We deliver to Delaware County, Chester County, Northern Delaware and parts of Montgomery County. 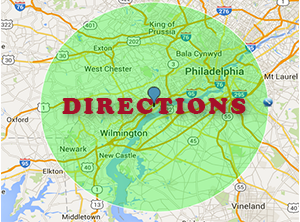 We will deliver to towns like Broomall, Swarthmore, Rosemont, Landsdowne, and more. Contact Us Today to get quality landscape materials delivered to Paoli, Brandywine, or Villanova. Have your Mulch, Stone, Sand, Topsoil Quality Landscape Supplies Delivered to either residential or commercial property. Schedule a delivery today and in most cases we will be able to bring it to you the same day or next. We provide quality, professional service. Call on Mulch Delivered for your landscape material delivery. Also, our two great locations sell, service and repair your landscape equipment in Delaware County, Chester County, Northern Delaware, and parts of Montgomery and Philadelphia Counties. We offer our knowledge on your lawn equipment so you can keep your lawn equipment running well. Burke Landscape Supply and Burke Lawn Equipment both offer genuine replacement parts for lawn mowers from eXmark, Ferris, and more. We have replacement parts for trimmers from Echo, & blowers from RedMax plus all of STIHL chainsaws, blowers, and trimmers. 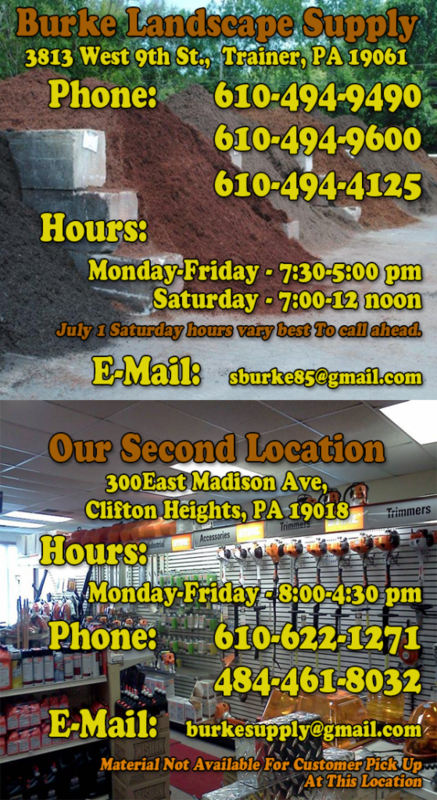 Contact Burke Landscape Supply for your lawn equipment needs. In the Winter Months, we service and repair snowplows and salt spreaders from top manufacturers like WESTERN, BOSS, Meyers, SaltDogg to to name a few. Also, we carry a large selection of bagged salt, rock salt, bagged calcium, calcium chloride and bulk salt. Call Us with your questions today.